Very Exciting News! We have just launched our Indiegogo fundraising campaign to bring the WITNESS Project youth’s deeply moving stories and powerful messages to an even wider audience through film! WE NEED YOUR HELP to make this happen! Go to our WITNESS Project Indiegogo Page by clicking on the image below. Also, please share it with your friends to get the word out. All the tools are there for how to share, get perks, make a contribution, or simply follow updates. If enough of us get behind it, we can make this happen for the kids and reach a larger audience to help stop the cycle of gender-based and child-directed violence. THANK YOU!!! "...Children who experience domestic violence are at a higher risk for failure in school, emotional disorders, and substance abuse, and are more likely to perpetuate the cycle of violence. Overcoming the problem of domestic violence will prove to be difficult and a long-term challenge, but each and every one of us can help stop the cycle. Last January, the embassy actively participated in the WITNESS Project – a campaign where Guyanese youths helped build awareness on domestic violence. Launched by the U.S.-based Margaret Clemons Foundation, the WITNESS Project engaged talented Guyanese youth to take photographs that became the basis of a city-wide poster campaign that sought to spark conversations on domestic violence and send a clear message: children are the most vulnerable and impressionable witnesses of domestic violence..."
se consists of residency classes both in Guyana and at the university’s campus in addition to online classes. 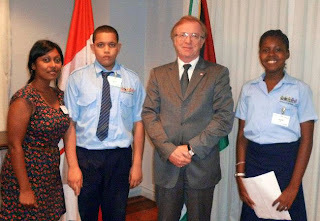 Tuition and travel costs for the programme which started in July were provided through funding from UNICEF and the Ministry of Education in Guyana. Margaret Clemons, whose foundation,‘The Margaret Clemons Foundation’ (also referred to as the Witness Project) supports the programme, told the Sunday Stabroek that the participants were drawn from the various administrative regions. Described as a “unique graduate degree that equips graduates to address pressing social issues” the one-year degree programme has a model specifically designed to equip individuals who serve families and children via government agencies such as the Ministries of Education and Human Services and Social Security, and non-governmental organizations (NGOs) such as Help & Shelter. The programme is tailored specifically to Guyanese needs, and graduates would be equipped to bring improved counseling and support services to urban and rural communities in a bid to help eliminate violence and trauma in Guyana. The programme aims to build the capacity of those offering protection and welfare support services to meet the pressing needs of Guyana’s youths. Graduates are expected to emerge not only as skilled mental health practitioners, but also as strong community leaders equipped to train others in their respective organizations and fields. According to Clemons the programme requires two three-week residences in Cambridge as well as two-week residences in Guyana, and the lecturers will travel to Guyana to meet the students. 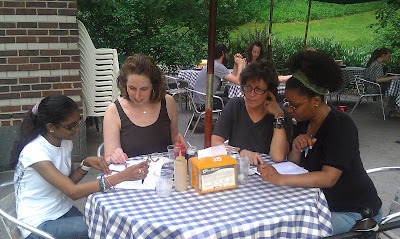 In the period between residencies the students would be in constant communication by email with the faculty. The Government of Guyana nominated the students for consideration and the individuals submitted applications for admission to the graduate programme at the university. All applications were screened and evaluated by university admissions and then by the graduate programme faculty, and qualified individuals were offered admission. Clemons disclosed that the programme is currently structured to be offered in cohorts of a maximum of 15 students. She said that Lesley University would like to offer this programme across the Caribbean and this possibility is being explored. “The curriculum has the flexibility to meet the unique needs of the group of students in a given cohort. In the case of the Guyanese cohort, prior to developing the curriculum Lesley University administrators met with government officials as well as prospective students to ascertain the curriculum content that would be of most benefit to the students who would participate. Further, the curriculum is designed in such a way as to ensure that it is culturally relevant and adaptable to the settings where the students are employed,” Clemons explained. Expanding on the involvement of her foundation Clemons said that it provided the impetus and the original concept that an arts based counselling programme for mental health providers might be useful. “[The foundation] introduced Guyana to Lesley and provided seed funding to facilitate initial collaborative conversations,” she told this newspaper. She disclosed that some of the initial undertakings to move the concept forward included a visit to Guyana with Lesley Associate Provost, Dr Gene Diaz and Division Director of the Division of Expressive Therapies, Mitchell Kossak, in March of 2010 for the purpose of gathering information from stakeholders and gaining a better understanding of needs and of the current programming underway. The foundation had also invited then Minister of Human Services and Social Security Priya Manickchand in 2010 to select four candidates from her ministry consisting of probation officers who were already working with children and families in crisis, including inmates from various regions, to attend the summer programme at Lesley University Peaceable Schools & Communities. That programme, she said, was augmented to include a robust arts programmme not part of Peaceable Schools. The foundation had also invited a counsellor from Help & Shelter to participate in the fully funded trip to Lesley. 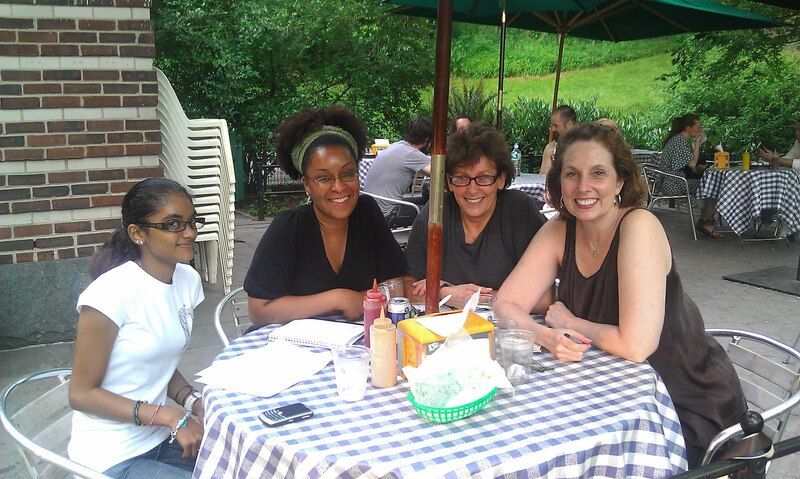 The five candidates travelled to Boston in June 2010, stayed on campus in student housing and participated fully in the programme. “It was exciting to see these talented professionals participating in the programming and also helpful in better understanding the tools that best benefited them in their daily work,” Clemons said. She pointed out that introducing programming that is culturally relevant is essential to the success of any programme, and as a result on returning to Guyana the ministry’s staff delivered a version of Peaceable Schools to other probation officers in Guyana. The minister also spent hours working with programme developers for the masters degree to address issues of cultural relevancy. In December of the same year the foundation sponsored Chief Education Officer (CEO) Olato Sam to visit Lesley University to continue working with programme developers. “This was also useful and added perspective from the Ministry of Education,” the foundation’s head said. When the foundation rolled out its ‘Witness Project turns Guyana INSIDE OUT’ poster project in late January 2012, Gene Diaz and Catherine Koverola, Dean, Graduate School of Arts & Social Sciences at Lesley University travelled to Guyana for the inauguration and to meet government officials and prospective students in order to move the programming forward. “While MCF has been instrumental in bringing this collaboration to fruition, needless to say, Lesley University has believed in this project and worked diligently at delivering programming that will make the difference. That this programming is now underway is our (MCF) greatest achievement,” Clemons said. 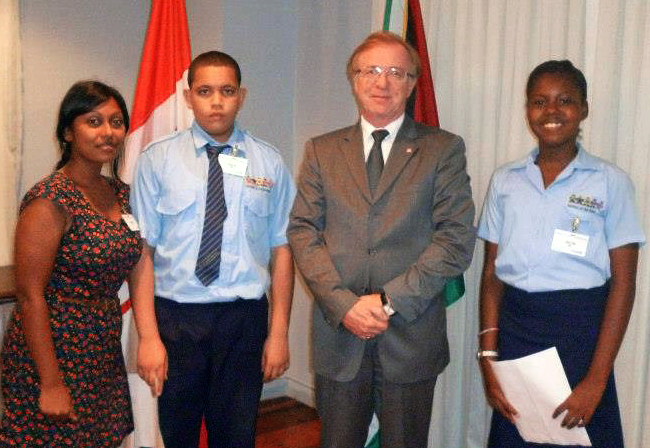 Today two of MCF’s WITNESS Project youths in Guyana, Marcel Persaud and Danita Jaundoo, along with Program Director Rosheni Takechandra, went to visit Canadian High Commissioner to Guyana David Devine to interview him for the WITNESS Project weekly youth page. The youth are interviewing various people for articles they will publish in the up and coming weekly youth page in the Stabroek News. The youth page will include interviews, stories, observations, poems, artwork and photography all created by the WITNESS Project youths. 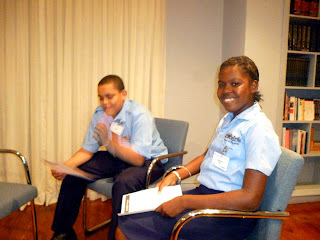 MCF is really excited about the youth newspaper page opportunity that will give the youth a loud and public voice to express their ideas, thoughts, and feelings in a creative way, allowing them to get their message out about how violence is affecting them and empowering them to be a part of the solution. We are going to start updating our blog soon! So much has happened in a year. We’ve been updating the WITNESS Project Facebook page with all the news and will get the MCF blog up to speed.